Strozzi, a Capuchin monk, was one of the greatest early seventeenth-century Italian painters. His works are often marked by strong contrasts of light and dark, which became one of the hallmarks of Italian Baroque painting. Taken from the Gospel of Saint Matthew, this scene shows Christ inviting Matthew, a tax collector, to join him as one of his disciples. Christ appears at the far right, barely identified by the hint of a halo at the back of his head. 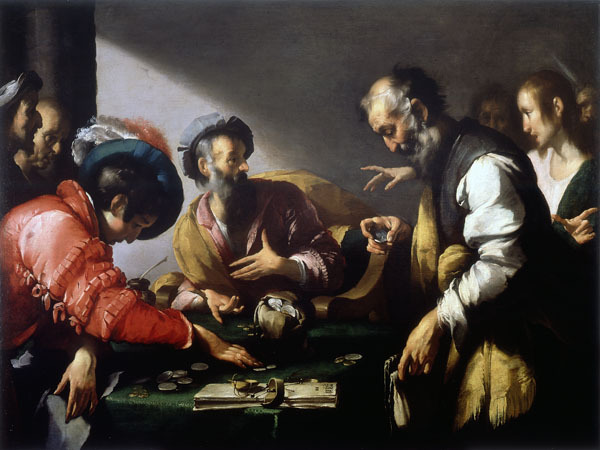 The strongest light falls on Matthew, who appears awestruck, while his assistants go about their business of counting money. The restlessness in the figure of Matthew is echoed throughout the painting by the animated brushwork and dramatic positioning, including a variety of exaggerated hand gestures. Strozzi's picture is closely related to an altarpiece of the same subject painted around 1598 in Rome by Caravaggio, the influential painter who popularized the use of dramatic lighting effects. It is not known whether Strozzi, a native of Genoa, ever traveled to Rome to see the painting by Caravaggio; he may have known it only through copies and reports of other artists.